Long after its iOS debut in 2016, ROME: Total War is now available on Android for users in North America, Europe, Australia, and parts of Asia. The turn-based strategy game lets players try their hand at a conquest of Europe, North Africa, and the Near East as one of 19 factions including Egypt, Gaul, and Britannia. 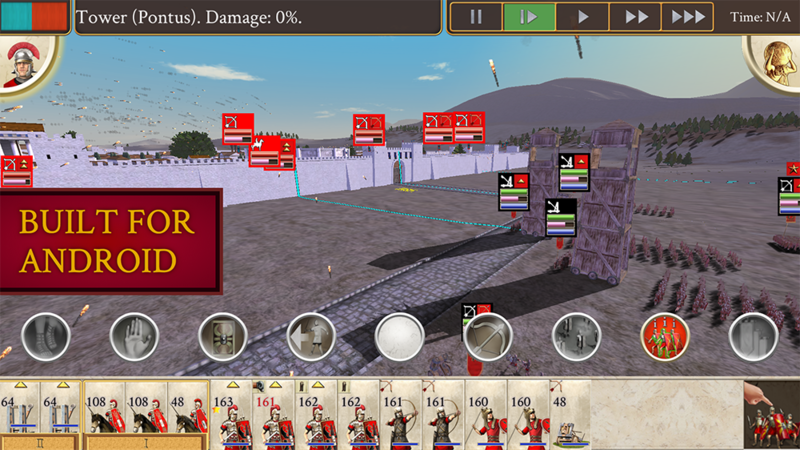 This Android port comes courtesy of Feral Interactive, the same studio that brought ROME: Total War to iOS. Feral's iOS port was generally well-received, with players praising the game for being a faithful port, but noting that many of the usual issues with ports do apply, including quirky controls and occasional crashes. The early reviews on the Google Play Store echo similar, mainly positive sentiments. The game officially supports the devices listed below, and may work on others (detailed in the Google Play Store description) though not at the same standard of performance, graphics, or stability. If you'd like to try ROME: Total War on your Android smartphone or tablet (the latter of which will probably be a better experience for this kind of strategy game), you can nab it via the Google Play Store for $9.99. Feral Interactive today announced that the acclaimed historical strategy game ROME: Total War is out on Android. Originally developed by Creative Assembly and published by SEGA for Windows PC, the game was previously brought to iPhone and iPad by Feral Interactive. A release trailer for ROME: Total War on Android is viewable now on the Feral YouTube channel.The supported devices for ROME: Total War are: Google Pixel, Google Pixel XL, Google Pixel 2, Google Pixel 2 XL, Google Pixel 3, Google Pixel 3 XL, HTC U12+, Huawei Nexus 6P, Huawei Honor 8, Huawei Mate 10, Huawei Mate 20, LG V30+, Motorola Moto Z2 Force, Nokia 8, OnePlus 3T, OnePlus 5T, OnePlus 6T, Razer Phone, Samsung Galaxy S7, Samsung Galaxy Note8, Samsung Galaxy S8, Samsung Galaxy Note9, Samsung Galaxy S9, Samsung Galaxy Tab S4, Sony Xperia Z5 Dual, Sony Xperia XZ1, Sony Xperia XZ2 Compact, Xiaomi Mi 6. Devices updated to Android 7 or later, with 3GB of RAM, and using one of the following chipsets... Qualcomm Snapdragon 810, HiSilicon Kirin 950, Samsung Exynos 8890, MediaTek Helio P20... may be capable of running the game, but will not meet the standard of performance, graphics or stability required for official support.